1parkplace takes a scientific approach to custom real estate website designs. Our REALTOR® websites are designed for form, function and versatility to offer you the most flexible, robust and successful solution available. We combine proven real estate web design theory, real estate specific SEO strategies, advertising call-to-action techniques and the latest in landing page optimization, to deliver a product that will perform magnificently for you. 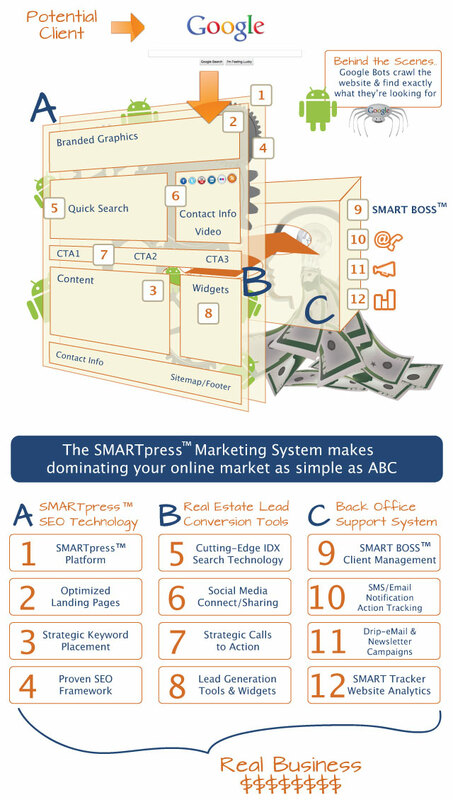 Our SMARTPress real estate websites offer REALTORS®, and real estate professionals, a robust, state-of-the-art real estate website marketing system. Combining compelling Google-friendly content publishing, an easy-to-manage dashboard, integrated WordPress blogging system and amazing looks, makes the 1parkplace SMARTPress real estate website solution the perfect companion to your existing real estate branding, real estate imaging and real estate marketing, helping you to increase sales and improve your ability to close more deals. The SMARTPress system is designed on a highly modified, widely admired, WordPress platform and is enhanced with framework modifications that enhance Google indexing, page loading and lead generation. 1parkplace takes a scientific approach to website development. Our sites are designed for form, function and versatility, to offer you the most flexible, robust and successful solution available. We combine proven web design theory, real estate specific SEO strategies, advertising call-to-action techniques and the latest in landing page optimization, to deliver a product that will perform for you. Enjoy the SMARTPress power package and save! Get more information now– click this link for more information on Custom REALTOR Websites by 1parkplace.